This superb high quality hypnotherapy audio program, by the UK's best-selling hypnotherapist Glenn Harrold, combines powerful clinical hypnotherapy techniques with state of the art digital recording technology. This title is part of the highly successful Diviniti Publishing Hypnosis range, which has sold over 500,000 units and is well established as the UK's best-selling self-help audio series. There are two 30-minute Hypnotherapy sessions on the program. 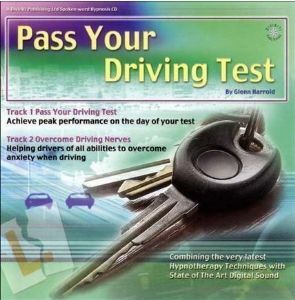 The first will help learner drivers to achieve a peak performance state and to be in full control of their feelings on the day of their driving test. Learner drivers with a pending driving test should listen to this every day in the final two weeks leading up to their test. The second portion of the program will help both learners and experienced drivers to overcome any driving phobias or anxieties on any type of road. On the program you will hear a pleasant English voice and sound effects guiding you into a deeply relaxed state of mental and physical relaxation. In this very receptive relaxed state you are given a number of post hypnotic and direct suggestions to help you to overcome nerves and to feel in control of your feelings whenever you drive. At the end of the recording you will be gently brought back to full waking consciousness with a combination of suggestion and music. There are also a number of positive subliminal suggestions, which are embedded in the fade out music and facilitate the overall effect. This powerful program is a completely safe and very effective way of helping drivers of all abilities to feel positive and in control at all times.